Next-generation techniques are already changing the way we do science. Recently the National Academy of Sciences convened a Workshop on Identifying Transformative Research in the Geographical Sciences. Given that so many of the challenges that we currently face are place-based (climate shifts, population migrations, depletion of resources, spread of diseases and terrorism, etc. ), the attendees of this workshop were asked to consider and define the role of the geographical sciences in transforming our understanding and approaches toward meeting these challenges. To wit, what makes research transformative beyond merely innovative, excellent, or even strategic? Professor May Yuan of the University of Texas at Dallas remarked that the fact that we have geographic information systems and science is transformative in and of itself! Certainly mapping and storing geographical information has changed the practice of many sciences, and has led to new emphases in spatial statistics and spatial humanities. But how do we go further? How does geography and GIS continue to address problems that really matter: to our theories, our methodologies, our best practices? How do we engender collaborations and partnerships that cross boundaries, intersect disciplines, and empower communities and networks from global to local? How do we train students to do transformative research, and further, to support it financially as well as intellectually? How do we see and appreciate the unexpected, to know why it’s unexpected, to be curious about what is creating the unexpected result, and how it all fits into a broader framework? What is a reasonable length of time from basic research to possible productization within [the GIS] industry? 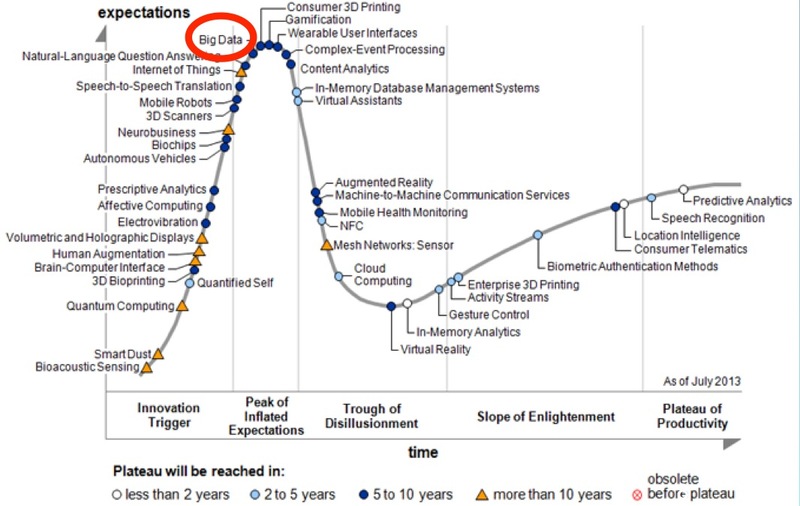 The Gartner Group Hype Cycle on Emerging Technologies for 2013 (courtesy of Gartner Inc.). Click to enlarge. 1. How has transformative research emerged and how did it become transformative? Some research has become transformative because of what we can DO NOW. One example lies in the widespread application of geographically weighted regression (GWR). GWR represents a move from regional or global models of measured and mapped relationships to local scales, and has thus been an extremely important advance in “methods, models, and GIS.” GWR has made it possible for different locations to be represented by their own regression models, and as such has “gone viral” as a concept and a technique. It is has been incorporated into hundreds of different studies, from mapping and understanding crime in cities to the distribution of habitats on the seafloor. GWR has also gained the attention of industry and has, for example, been formally incorporated into the core functionality of ArcGIS for Desktop, which further exposes the research to literally millions of users beyond the academic sector. In my opinion, this is a significant marker for transformative geographic research because it will be leveraged in so many ways not originally foreseen by the authors, thus fostering an even longer lineage for the research. Another example lies in the ocean where only 5 to 10% of the waters beneath the surface and the seafloor have been explored and mapped in a level of detail similar to what already exists for Mars, Venus, and the dark side of the Moon. Even so we are still approaching tremendous accomplishments: current mapping systems located beneath ships are routinely linked to underwater video or photographs collected from vehicles towed behind ships, and are collated to samples and measurements collected from instrument or vehicles either launched away from ships or operating independently on the ocean floor. With today’s modern dual-head sonars that capture shallow bathymetry, backscatter, and water column characteristic, the rate of data collection is ~115 GB/hour. Our sensor count in the ocean already approaches 2 million and that will likely double every five years. So the oceans have always been about “big data,” despite how much remains to be explored. And these data collection enterprises have transformed ocean science (including marine and coastal geography) from a predominately modular, individualistic science into national and multinational interdisciplinary science collaboratives [Briscoe, 2008]. This has certainly transformed our understanding of all aspects of the oceans, from the structure and tectonics of the ocean crust, to the abundance, diversity, and overall health of hundreds of species of ocean life, of storm systems and dangerous tsunami events from underwater earthquakes, and much more. Some research should have been transformative, but in hindsight was not. Some of it is considered transformative now because in the past it was not even considered to be a research area (e.g., the “respect” now afforded by other disciplines to geographic information science, the current emergence of “data science” or “informatics”). Indeed informatics was largely ignored in oceanography at its peril given the emergence of new data collection capabilities. Only recently has it come to the fore [Baker and Chandler, 2008]; many would say just in the nick of time. Witness also the National Science Foundation’s requirement of data management plans as part of grant proposals, unheard of a mere 10 years ago. 2. What might be the early markers of transformative research and how does it become possible to identify its transformative character? An early marker of transformative research may be how disruptive, risky, audacious, or controversial it is. But it becomes accepted and deemed transformative with the fascinating research problems it presents, and the technology investment it engenders. To wit, the rise of the drones (e.g., unmanned/uncrewed aerial vehicles or UAVs), and the interesting GIS challenges they pose for georeferencing frames in full motion video, and interpolating telemetry and metadata therein. Indeed some transformative developments “come out of left field,” showing in part the benefits of just “letting the engineers play” [e.g., Bellingham et al., 2007] or let scientists be “distracted” by multidisciplinary/interdisciplinary investigations [Scheffer, 2014]. Acknowledging that societal issues have become huge drivers of science is transformational (in my opinion) and for some is a disruptive concept. In this context science is conducted not only to increase our fundamental understanding of the Earth, but also to protect life and property, to promote economic vitality, and to enable stewardship of the environment. In seeking to communicate not only to fellow scientists but also to policy-makers and journalists, we are navigating and transforming the rules of scientific engagement [Smith et al., 2013]. Indeed, there are many unresolved policy problems in society, such as high unemployment and economic competitiveness, oil and gas versus alternative energy, proper stances against nuclear proliferation, public health issues, climate change, and the loss of biodiversity, all of which increasingly revolve around science. Government leaders, particularly in the US, struggle with the ramifications of critical societal challenges such as climate change, environmental hazards, and living sustainably. And science is now often part of an unavoidable and contentious public discussion of these issues. Many argue that scientists need to participate in catalyzing solutions to these problems. 3. What has helped nurture and bring transformative research to fruition and how can it be fostered? Increasingly, scientists who are communicators are moving into positions of leadership, engaging with society, and changing their academic institutions from within, training the next generation of scholars to respect and implement science communication. Another alternative form of science communication is that of scientific “storytelling.” In general, the approaches and technologies of geographic information science can be used quite effectively to tell “stories” about important connections among scientists (e.g., within Stanford’s Leopold Leadership Program), their messages, audiences, and ultimately stories about the world. Combining the new medium of “intelligent Web maps” with text, multimedia content, and intuitive user experiences has a great potential to inform, educate, entertain, and inspire decision-makers about a wide variety of environmental issues [e.g., Field, 2012; Wright, 2013]. Transformative = what we can DO NOW. Transformative = what we CANNOT do now. Disruptive can be transformative, including societal drivers for science and science communication. “Many of the breakthroughs in science were made by people who were…distracted” [Scheffer, 2014]. Thanks to Erik Hoel for helpful discussions and the image that contributed to this post. Download the free National Academy of Sciences report resulting from this workshop.